"absolutely no compromises", "highest-possible image quality", "accept no substitute", "exceptional performance", "spectacularly detailed", "optical and technical excellence", "perfect optical correction", "highest contrast performance", "outstanding sharpness", "exception to the rule" and ... "The best standard lens in the world"
Those are big claims to substantiate, but Zeiss is not company that I associate with unfounded marketing claims. Adding credence to these claims is the price tag of this lens – more than double the price of any competing 50-something mm lens. To be viable in the marketplace, this lens must deliver impressiveness. A number of the good applications for this lens include people as subjects. A 55mm lens used on a full frame body is modestly too wide angle for tightly framed head shot portraits (for my taste), but 55mm is very nice for less-tightly-framed head and shoulders, partial body and full body portraits. Mount a 55mm lens on an APS-C/1.6x FOVCF body and tighter portraits retain a better perspective with noses remaining attractively small. Canon DSLR camera owners can find an f/1.2 50mm autofocus lens available and a discontinued 50mm f/1.0 AF lens remains in circulation. The current Nikon mount is too small to support autofocus on lenses with a max aperture wider than f/1.4, but the fully manual NIKKOR 50mm f/1.2 AIS Manual Focus Lens is available and an out of production 55mm f/1.2 lens exists. Otherwise, the Otus at f/1.4 has the widest 50-something mm lens aperture available in Canon or Nikon mounts, matching many other offerings. Following is a pair of aperture walk-throughs. 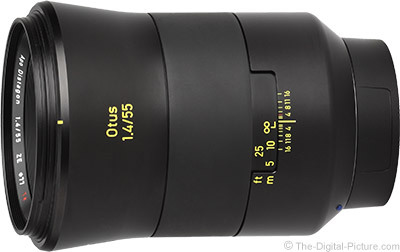 The majority of photographers buying the Zeiss Otus 55mm f/1.4 Distagon T* Lens can be described as "discerning". These photographers know what they are getting for their money and premier image quality is the primary driver behind this purchase. With a very flat plane of sharp focus, the Zeiss Otus 55mm f/1.4 Distagon T* Lens is extremely sharp across the entire imaging sensor at f/1.4, including all four very-extreme full frame sensor corners. The extreme corners are so sharp that this lens appears to be ready to support larger medium-format sensors. How remarkable is this image quality? It blows every other available 50-something-mm lens out of the water. 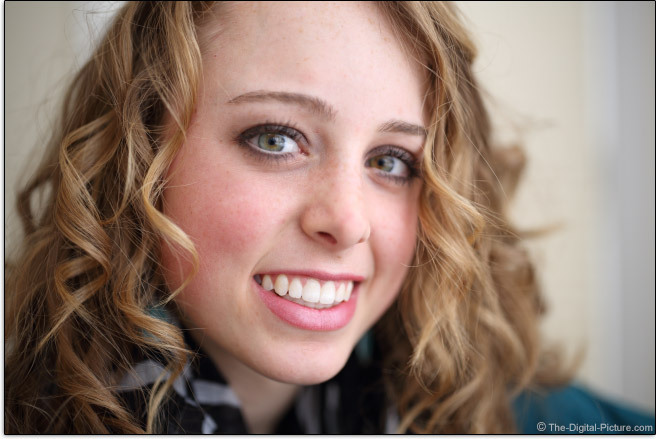 Let's take a look at some f/1.4 comparisons. CTRL-Click on these links to open them in a new tab (saving your place in this review). Then use the mouseover feature to see the difference in image quality. Also consider selecting narrower apertures to compare. The Nikon image quality test results shown in the site's image quality tool are of course captured with a different camera body, but these results are also available for you to view with discernment. The Zeiss 50mm f/2.0 Makro-Planar T* ZE has a one-stop-narrower max aperture, but it is a remarkable lens itself. Compare this one to the Zeiss Otus 55mm at f/2: Zeiss 50mm f/2.0 Makro-Planar T* ZE Lens. I am often asked if it is a waste to put a great lens on a smaller APS-C format sensor. I say no, it is definitely not a waste. Because these smaller sensors usually have more-dense pixel configurations, they can make full use of higher resolution lenses. Near perfection in image sharpness does not mean vignetting-free. If you look at the aperture stop-down example above or view the vignetting test results for this lens, you will see a noticeable 3+ stops of vignetting in full frame corners. About 2 stops of peripheral shading remains at f/2 and just less than 1 stop remains at f/2.8. You will be pressed to notice any shading by f/4. About 1 stop of shading will be seen in APS-C/1.6x frame corners at f/1.4. Stopping down to f/2 basically eliminates APS-C shading. One of this lens' strongest features is its wide open image sharpness. The Otus equals most other 50-something-mm lens in this regard, but vignetting is always something you need to be aware of. 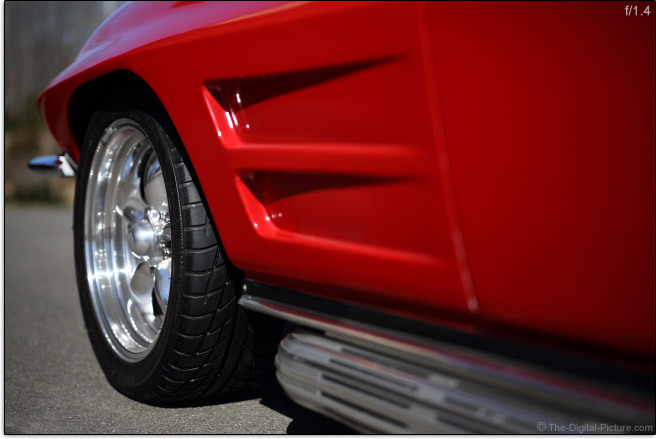 You need to be aware of how the vignetting will affect images captured with a wide open aperture and be prepared to correct the vignetting (or avoid the widest apertures) if necessary. Vignetting at f/1.4 results in a bright center of the frame. For example, in the 2/3 body portrait I shared earlier in this review, Brianna's shirt appears too bright relative to her eyes. While the not-too-brightly-colored shirt does not look bad in this case, a brightly-colored shirt does not look as good. But if the subject is rendered in the darkened area of the wide open aperture image circle, peripheral shading correction will often be desired. And a narrower aperture may at times be a better solution. I've mentioned that the f/1.4 aperture is the Otus' big advantage and that portraits are one of the best justification uses for this lens. Since 50mm is best for portraits framed wider than head shots, the subject's head will not typically be centered in the portraits where this lens is most ideally used. So it seems that f/1.4 is not always a great choice due to vignetting. But, stopped down to f/2, the Otus has less peripheral shading than its closest competitor from an image quality perspective, the Zeiss 50mm f/2 Makro. You may have noticed that the f/1.4 aperture examples shown in the aperture comparisons above are a bit darker than the other aperture samples. Most of the darker-ness is caused by peripheral shading, but the center of the Otus f/1.4 frame is typically 1/6 - 1/3 stop underexposed relative to f/2 exposures using the equivalent change in shutter speed. As you can see in the tight portrait example just above, depth of field at f/1.4 with a close subject is very shallow and compromises may be needed in plane of sharp focus placement. And you can expect the out-of-focus portions of your frame to have pleasing bokeh (blur quality) as seen below in an f/5.6 100% crop example below. The not-completely-round out-of-focus highlights produced by the Otus 55 have a modestly bright peripheral ring (common) with a very smooth center. The Otus 55's 9-blade aperture will produce 18-pointed stars from specular highlights when used with a narrow aperture. The above stars were created using an f/10 aperture. Stop this lens down to the minimum aperture, f/16, for even larger stars. The Zeiss Otus 55mm f/1.4 Distagon T* Lens has coma under control, is impressively flare-free and is impressively CA-free (Chromatic Aberration-free). Throw your toughest subjects at this lens and it will amaze you. 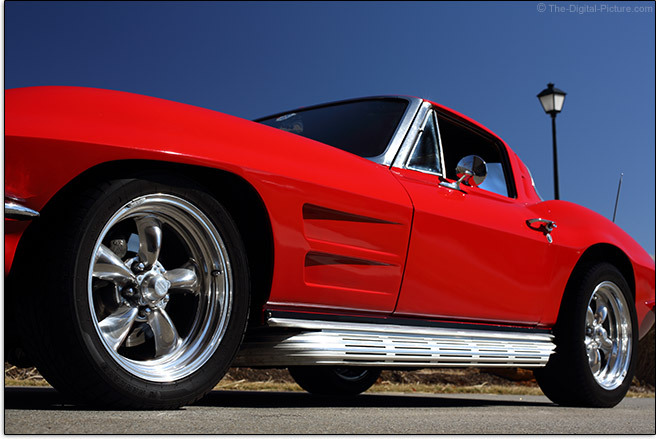 The car is a 1963 Corvette Stingray. It simply glowed under full sunlight. 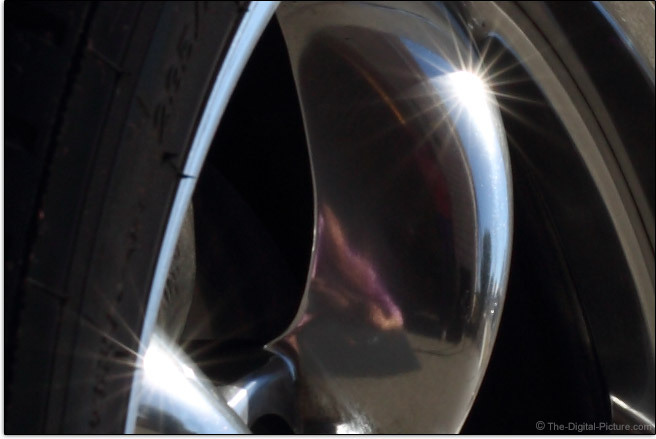 A B+W XS-PRO circular polarizer filter cut the reflections on the car body and deepened the blue sky. By using an on-the-ground shooting position, I was able to eliminate most of the residential development and dead winter grass from the background. The Zeiss Otus 55mm f/1.4 Distagon T* Lens is the most-distortion-free non-macro fifty-something mm lens I've used. Architectural photography more-frequently makes use of focal lengths wider than 55mm, but the Otus 55 can be used for this purpose – and architecture can be unforgiving to barrel or pincushion distortion. 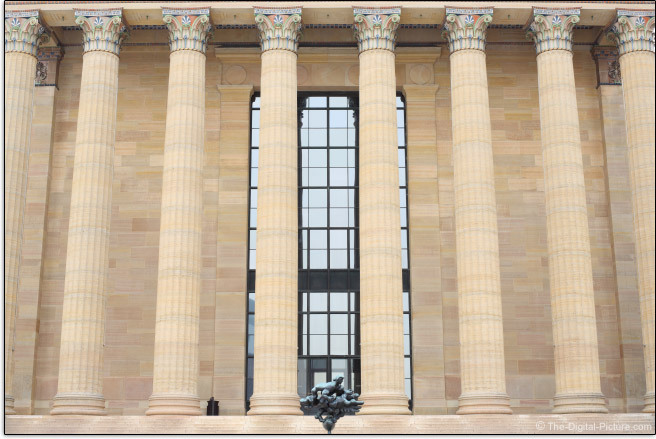 As can be seen in the Philadelphia Art Museum sample picture below, the Otus has a small amount of barrel distortion. To be honest, I didn't notice the distortion until processing my images. The distortion is minimal enough that framing ideally-aligned architecture was not challenging to me. Proper framing is a big challenge when using a lens with more-pronounced distortion. 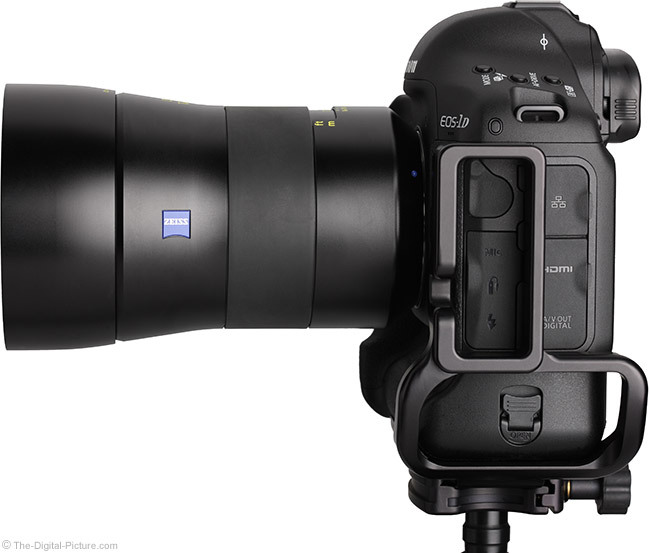 The Otus 55, like all of the other Zeiss ZE and ZF lenses, is manual focus-only. 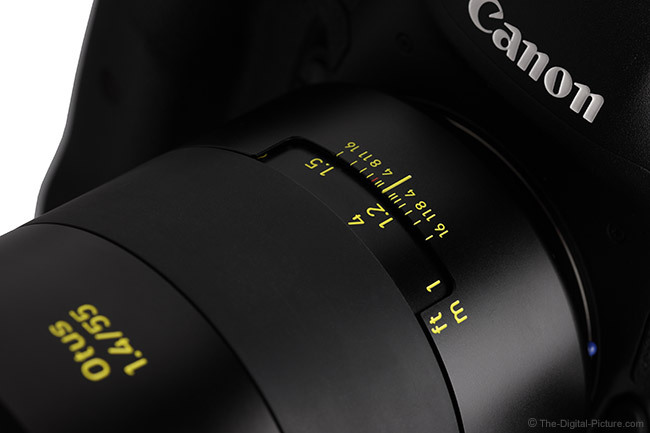 But it delivers excellence in manual focusing. 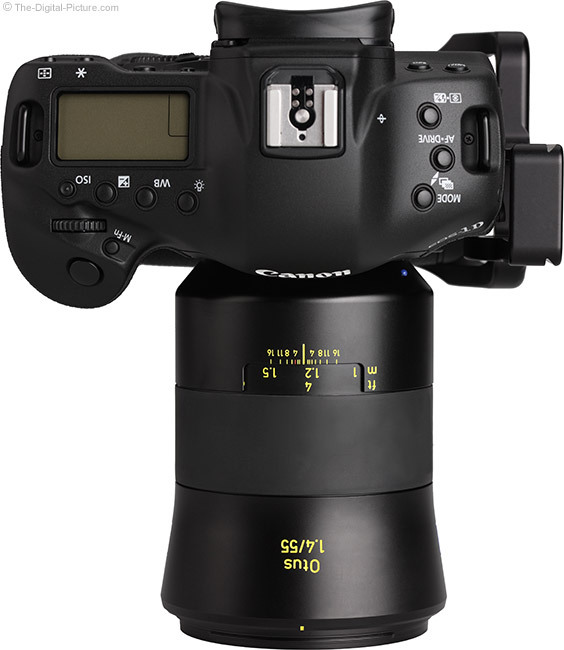 The extremely smooth, ideally-dampened focusing ring with a huge 245° of rotation allows very precise focusing. Subjects change size in the frame by a modest amount during a full extent focus adjustment, but size changes during short focus adjustments will not likely be noticeable or minimally not bothersome. As expected for a lens of this class (and for all of the Zeiss lenses I've used to date), the front element does not rotate during focusing. This is important for use of some filter types including circular polarizer filers. 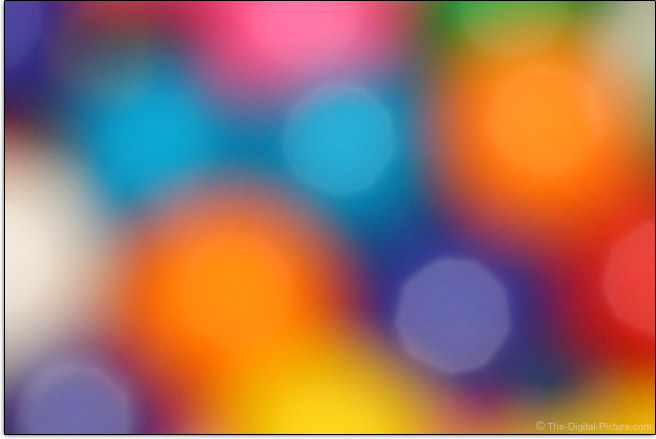 A full DOF (Depth of Field) scale is provided – including wide aperture marks – not just f/11 and narrower. Unique from the Zeiss ZE and ZF lenses is that the Otus 55's ft/m distance scale resides in an uncovered window built into the lens barrel. A concern I have is that dust/dirt can get into the lens in this area by landing on the ring and getting turned under the lens barrel housing. My concerns were unfounded during my time with this lens. Also unique from the ZE and ZF lines is that the lettering and markings are in a high-visibility yellow paint. While I remain a bigger fan of the color white from a cosmetic perspective, functionality is paramount with this lens and the yellow color is said to be ideal for use in low light conditions. All markings and lettering on this lens are etched into the metal lens barrel, focusing ring and lens hood. Infinity and minimum focus distances are hard stops with distant subjects (such as stars) being sharp just before the infinity hard stop. Focus distance settings are easily repeatable. With a manual focus-only lens, focus accuracy is 100% your responsibility. When using a tripod with 10x Live View manual focusing, my hit rate is nearly 100% even at f/1.4 with a close subject. With a stock DSLR focusing screen, my f/1.4 hit rate is significantly lower. One of the few non-remarkable features of the Zeiss Otus 55mm f/1.4 Distagon T* Lens is the MFD (Minimum Focus Distance) and resulting 0.14x MM (Maximum Magnification) spec. While this figure is near worst in class, it is only relevantly worse than the macro lens variants of the 50-something mm lenses. Even at 0.14x magnification, reasonably tight portraits can be obtained as shown above in the vignetting discussion. If you need a shorter MFD and greater MM, use an extension tube. This lens' build quality gives up nothing to its image quality. The Zeiss Otus 55mm f/1.4 Distagon T* Lens is built like few other lenses and using this lens is nearly as fun as reviewing the images it delivers. The smooth-shaped, rock solid, all metal construction features only one moving exterior part – the focus ring, which, as I said before, is also very smooth. The focusing ring is smooth-rubber-covered for a better tactile feel under a wider range of temperature conditions. 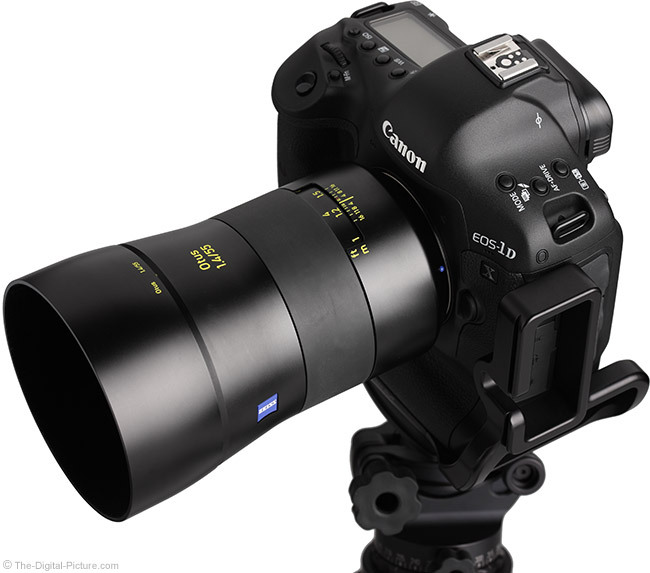 This is a change from the ribbed metal focus rings typically found on Zeiss ZE/ZF lenses. As seen below, the focus ring is flush with the rest of the lens barrel. The smoothness and flushness of the ring make it slightly difficult to find, but it is nicely sized and in ideal-to-slightly-forward position for use. The Otus 55's lens barrel is straight with a gentle outward-flaring contour starting in front of the focus ring and finishing in the lens hood. The metal lens hood is substantial – It does not noticeably deform even when very firmly squeezed. 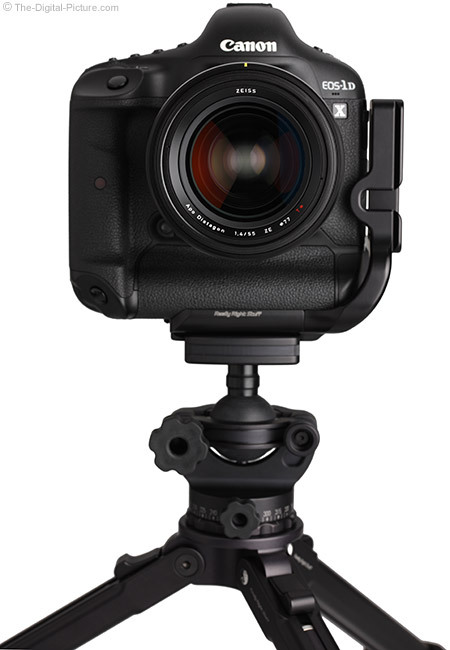 The metal lens hood is so strong and well integrated/contoured that it simply feels like an extension of the lens barrel. This design is so comfortable that I frequently find myself supporting the lens partially by the hood (insure it is properly installed before doing this) while using my thumb and index finger to fine tune focus. The Otus 55 is in a size and weight class of its own. This lens is built like a tank and it feels like it – relative to the other 50-something mm lenses of course. For many more comparisons, review the complete Zeiss Otus 55mm f/1.4 Distagon T* Lens Specifications using the site's Lens Spec tool. This is a handful of a lens. You know that you have something in your hand when using this lens and constant manual focusing detracts modestly from shooting comfort. Still, the Otus 55 is not so heavy that the size and weight bothered me significantly during use. I admit to taking an occasional rest during a long portrait shoot that had me shooting handheld from awkward positions. Those acclimated to using only light lenses may need some time to get used to the weight. On a tripod, the weight means little. Though this is a relatively large lens, the filter thread size is only a mildly large 77mm. This filter size is very common, making filter sharing possible in many kit configurations. The Otus 55 is clearly largest in its class. I'll load another comparison using the product images tool. Use this tool to create your own comparison. No case is included with the Otus 55. I've been carrying this lens with hood in ready-to-use position mounted to a camera body in a Lowepro Toploader Pro 70 AW. This is an ideal carrying solution for this combo. At this point in the review, you are probably thinking, "Perfect. Where can I get this lens?!" Unfortunately, many photographers will, faced with the price tag, encounter a show-stopper. Without question, the biggest hurdle this lens faces in the marketplace is its price. 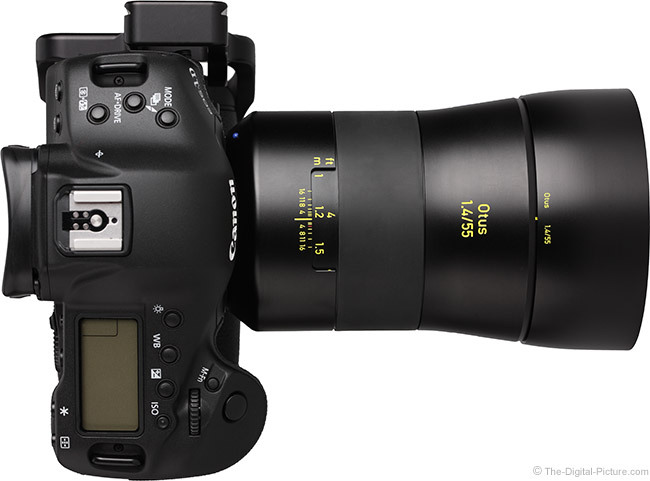 There are a lot of 50-something mm lenses, but none reach even half of the Otus' price. Justifying the price for this lens is a significant hurdle that needs to be overcome. "The cost of the lens is determined by the type of materials used and the amount of labor which goes into making each lens. The Otus 1.4/55 uses 6 lens elements with anomalous partial dispersion and a double sided aspheric. The production time is considerably longer and more measurement steps are taken to ensure the lens meets the specs. The lens is also the result of an extensive 3-year development process, involving many Zeiss scientists and engineers. Taken together, the lens is more expensive to make and results in the higher selling price." Putting the price into perspective, wildlife photographers often spend two or three times this much for their primary lens. I love wildlife, but will argue that the human subjects this lens will often be used to capture are even more valuable. Easy to justify is the Otus 55 on a high res DSLR compared to a Leica S, Hasselblad H5D60 or Mamiya with a P65 back. Richard explains "We've done extensive comparisons vs these other medium format systems and can say the Otus on a high res DSLR will produce images of comparable quality." Richard continues "... the Otus was designed in part for our former medium format customers. These are photographers who used Zeiss lenses on their Hasselblad, Rollei or Contax cameras, but who have migrated to full frame DSLR's over the last 9-10 years. These photographers still have the same demands for the highest image quality and build quality. 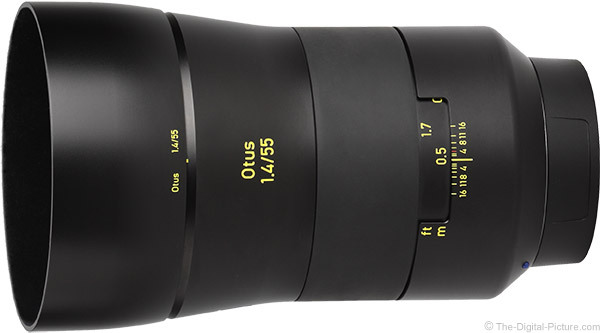 In some respects, the Otus lens is for DSLR cameras what the Zeiss lens used to be for the Hasselblad V system. It's a no compromise lens designed to be used as a working tool by photographers who both need and can appreciate a difference." "As a whole, these are discriminating photographers who are not satisfied with their existing lenses. They are users of high-res, full frame DSLR cameras [snip]. From what some dealers have shared with me, they are the who's who of today's masters in the fashion, lifestyle and documentary world. We have also seen some orders taken for video use, though this is not an application we will push until there is a small family of focal lengths available." I have used a LOT of other 50-something mm lenses. There are some good performers, but the recently-reviewed Zeiss 50mm f/2 is the only other lens option with wider-than-f/2.8 image quality worth raving about. Though the Zeiss Otus 55mm f/1.4 Distagon T* Lens is an optically superior lens, the Zeiss 50mm f/2.0 Makro-Planar T* is the manual focus lens you should next consider if your budget does not reach the Otus level. 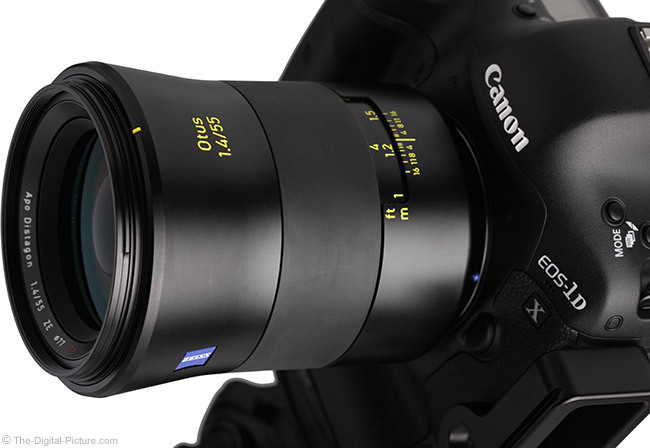 The Zeiss Otus 55mm f/1.4 Distagon T* Lens is available in Canon (reviewed) and Nikon mounts. My standard disclaimer is to say that there are potential compatibility issues with third party lenses. However, I consider the compatibility risk of a manual focus-only lens to be quite low. The Zeiss Otus does have communication with the camera body (including an electronically controlled aperture), but without the added complexity of auto focus, I have a very low compatibility concern. 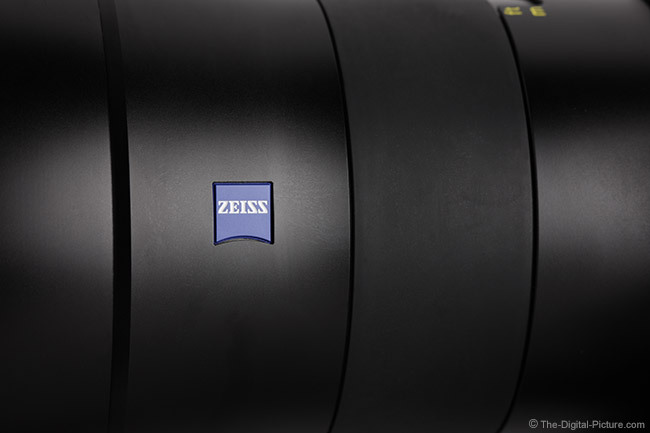 Zeiss includes a 2-year limited warranty with this lens. 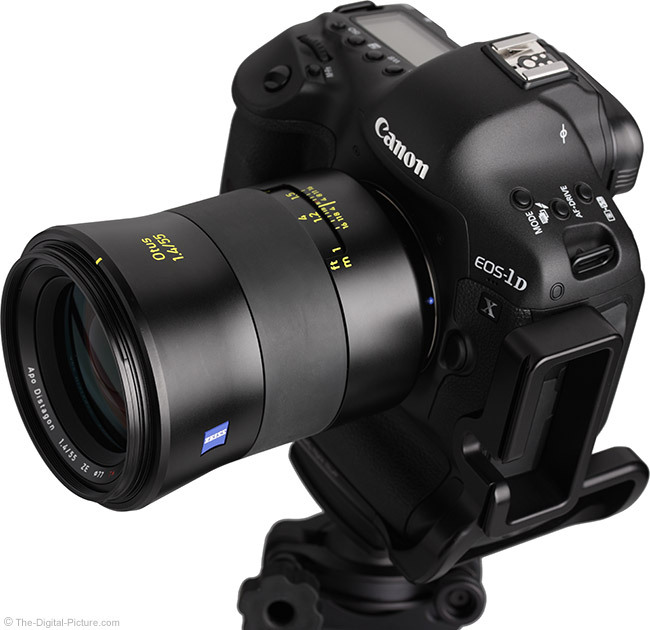 As I complete the Zeiss Otus 55mm f/1.4 Distagon T* Lens review, the demand for this lens far exceeds the supply. The reviewed Zeiss 55mm Otus was on loan from Zeiss, and unfortunately, had to be returned. I'll of course be looking for an excuse to add one of these to my personal kit. With the Zeiss Otus 55mm f/1.4 Distagon T* Lens in your hands, you have the confidence in knowing that there is no better lens available in a focal length even mildly close to 55mm. If a 55mm manual focus lens will meet your needs and your budget accommodates the Otus' price, I highly recommend that this lens finds a home in your kit. Fifty-something mm lenses are wildly popular and this field has long been crowded. But finding a truly remarkable wide aperture 50-something mm lens was arguably not possible – until now. Zeiss Otus 55mm f/1.4 Distagon T* Lens is indeed a lens worthy of hype. This is an impeccably well built lens with incredible image quality. 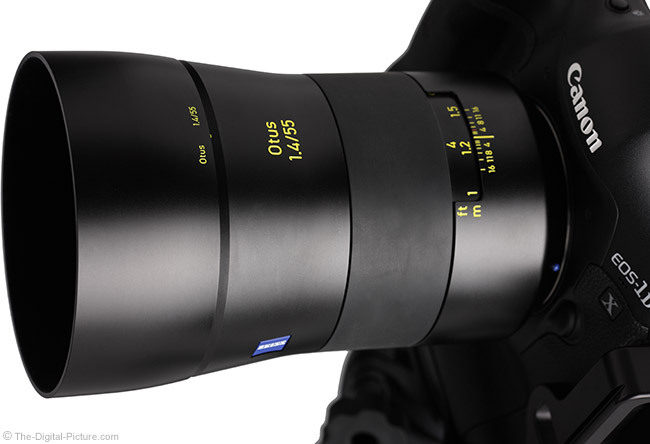 Kudos to Zeiss for bringing us the Otus 55mm f/1.4 lens, the first in what promises to be a exceptional line of lenses.